The Church of England’s General Synod had to talk about something, I guess. It couldn’t talk about the pressing problems of the CofE lest it cause its nascent civil war to flash into armed conflict. Bishops may have principles, but they also have budgets. So since it couldn’t talk about the CofE’s relentless drift into postmodern religion, it cast its eyes across the terrain and decided to reflect upon… the Ethics of Nuclear Weapons. Of course. The CofE is certainly my go-to authoritative source on that subject. Unfortunately, the reflection didn’t actually reach any ethical conclusions or answer any ethical questions. It managed only to present a sufficiently virtuous pose. The whole effort was nothing so much as an Ice Sculpture of Socialist Anglican Realism – attractive to people who appreciate the ideology, but transient; melting into obscurity even as it was being presented. One finds it hard to imagine the MoD eagerly downloading this document to receive such ethical guidance as it might provide. Lest you be concerned, you will be reassured to know that this reflection was offered in “Christian hope – a hope that is not naïve and imprudent, but one that is rooted in the present – in God’s today”. Whatever that means. Personally, I would rather this reflection had been rooted in history and a sober assessment of man’s nature rather than “God’s today”, but perhaps I am insufficiently postmodern. The proximate cause of this reflection was the advent in the United Nations General Assembly of something called the ‘Treaty on the Prohibition of Nuclear Weapons’. It seems a collection of non-nuclear states have gathered themselves together to propose a treaty banning nuclear weapons, and the CofE approves. No nuclear states have participated in this proposed treaty – which would seem to be a problem for those desiring to offer a hope that is “not naïve and imprudent”. On the other hand, the reflection instigated by this treaty didn’t actually offer any hope at all. It managed to produce nothing but a list of arguments for and against. It did, however, assure us that “there is widespread agreement among Christians that nuclear weapons are, as a class, uniquely terrible and that there is a legal and moral obligation among the international community to take all practical and prudent steps towards achieving a situation where none remain in existence anywhere”. If you happen to have a pouch of magic unicorn dust in your pocket, you might be able to offer that hope in a manner that is neither naïve nor imprudent. Otherwise, nuclear weapons aren’t going anywhere. They are far too powerful, far too capable. Wars are won by achieving strategic objectives. Traditionally, that means Nation A sends an army to destroy Nation B’s army. Then Nation A can impose its will. Nuclear weapons allow strategic objectives to be directly achieved. Nation A no longer needs to suppress the enemy’s ability to fight by closing with and destroying his enemy’s military. Nation A can go over the top, and directly destroy Nation B’s ability to make war. So if Nation A has nuclear weapons, and nation B does not, Nation A wins. In fact, Nation A probably won’t even have to fight. It can simply compel surrender. The option of war becomes the option offered to Czechoslovakia by Hitler in 1938: ‘Surrender or be destroyed.’ And when Nation B becomes defenceless, Nation A will destroy it anyways – confer with Czechoslovakia in 1938. So the major powers cannot afford to take the risk of disarmament. There is no agreement so secure that it cannot be violated. To actually disarm and then discover your enemy has not done likewise is the very definition of geostrategic disaster. Who will remain to hear any complaints about a treaty violation? And even if (in some parallel universe) nuclear weapons could be eliminated, the knowledge still remains to re-construct them. There can be no secure guarantee they would not reappear. No, the only thing that will remove them is obsolescence – like the bullet made the arrow obsolete. You can’t undo what has been done. They are here to stay. If they are here to stay – if we must surrender the fantasy of merely wishing them away – then we must face the reality of dealing with them. Nuclear weapons do have a devastating impact over an area of effect so vast that they do not – cannot – discriminate. In terms of weaponry, they are “uniquely terrible”. That’s why they are so uniquely effective. It is also why they must be carefully managed. They can, one must admit, be managed by the expedient of refusing possession. This decision is binding on no other nation, and can never be safely secured by a treaty, but it does remove all the responsibilities that attach to the possession of such destructive power. This choice also allows for the option of finding protection behind a friendly nuclear-armed state, although this isn’t so much management as evasion. It just shifts the responsibility for “uniquely terrible weapons” onto a third party while the benefits continue to accrue. The other choice is to ride the tiger, so to speak. You develop both the capability and policies that govern their use. Make no mistake, however. Possession implies a willingness to use. This is not a case of elaborate bluff. If the enemy does not believe you will use them, then there is no deterrent value, and you might as well not possess them. Someone has to be willing to give the order, and someone has to be willing to obey the order. The moral dilemmas associated with their “uniquely terrible” impact cannot be evaded by pretence. But if there is no pretence, then they become part of the war plan. They aren’t just there for show. Even if it is true nuclear weapons are “uniquely terrible” among weapons, however, it does not follow that they therefore must constitute the most uniquely terrible possibility in human experience. War is not the worst of all possibilities, and so by extension neither is nuclear war. It is true, for example – historically, undeniably true – that what happened in Poland after September 1939 was orders of magnitude worse than what happened in Poland during September 1939. The true weight of defeat is only felt when the conqueror is no longer constrained in his actions. So then, stare squarely at the possibility of what might have been. Imagine a Britain standing alone against Hitler, abandoned by an indifferent US, crippled for lack of resources, starving for lack of food, and facing inevitable defeat. If it had been the Manchester Project instead of the Manhattan Project, should Churchill have withheld the strike for the sake of principle? Would it have been better for him to accept defeat and all that would come with it just to avoid the nuclear devastation of Germany? Should he have said: “Better the Reich should win than 30 million dead Germans on our consciences. Better a million dead Brits and a thousand years of darkness”? And what say you, dear reader? Would you trade a Reichsprotektor for the belief that nuclear weapons should never be used under any circumstance? A Governor General perhaps? That’s where you have to go. You have to accept that your nation would suffer the fate of Czechoslovakia. You must acknowledge that your people would be delivered up to the fate of Poland. And you must do so knowing that there will be no rescue. It’s easy to talk about the ethics of this subject in terms of abstract philosophy – especially among bishops and church leaders who carry no responsibility for the outcome, and even more so when those leaders feel no actual threat of either war or conquest. They can mewl about the declining “liberal international order” as if it has ever protected anything in its existence. They can pontificate about the “legal and moral responsibility” to free the world from nuclear weapons without once having to take responsibility for a decision. They have the luxury of pretending that such a goal is achievable when it is in fact a childhood fantasy. Yet the ethics at base are really quite simple. There is a people, and there is a responsibility to protect them. Are you willing to see that responsibility fulfilled to the extent required? Or will you stand aside at the border of the Sudetenland and let the German Army cross into your territory? Will you trust their promises about how much they want? Are you willing to accept the consequences when your trust is proven foolish and vain? Will you admit that Treblinka is an acceptable cost for keeping your principles? There are things much more terrible in scope and impact than a nuclear detonation. It’s simply a matter of whether you are willing to endure them for the sake of principle. 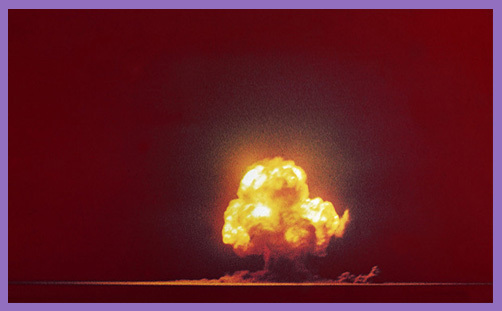 On July 16th 1945, the first atomic weapon was detonated in the New Mexico desert about 25 miles southeast of a town called Socorro. The site was given the name ‘Trinity’ by Robert Oppenheimer. I had the opportunity to visit Trinity earlier this year. Making the trek was a kind of self-imposed professional responsibility for me. Trinity represented the origin of my military service, and I felt obligated to see that origin. It’s real for me, you see. I have lived in the operational world that began in New Mexico and continues to this day. I know the responsibility because I carried it. The first four months of my military service I was assigned to the 4315th Combat Crew Training Squadron, learning how to be a Missileer. During week three, we began Emergency War Order (EWO) training. They taught us a few basics – the structure of the war plan, message decoding, checklist execution – and then they had us execute one EWO scenario in a Missile Procedures Trainer. We turned keys and saw the ‘Missile Away’ lights come on. The next day in the classroom, a paper was placed in front of each student in the class. It held a short paragraph that said: “I understand the nature of my mission and I will perform it. Sign and Date.” I signed the paper. Within four months, I was pulling alerts with real sorties. How could you do that, Christian? How could I not, considering what was at stake? How could I accept the protection of others having refused to offer that protection myself? If it was immoral for me to offer it, then it would be immoral for me to accept it. Would you have done it, Christian? Would you have turned that key? Quicker than you can blink. Deterrence is only as good as the willingness of one man to pull the trigger. Would you rather that I had not been so willing? Or would you rather have been a red stain on a Russian boot? And, no, that’s not a false dilemma.